Venue: Kolkata, India. Date: Wednesday, 25 October. Kick-off: 12:30 BST. England's ability to "play with freedom" has allowed them to reach the Under-17 World Cup semi-finals, says midfielder Morgan Gibbs-White. The Young Lions face Brazil in India on Wednesday after defeating Japan on penalties in the last 16 and beating the USA 4-1 in the quarter-finals. 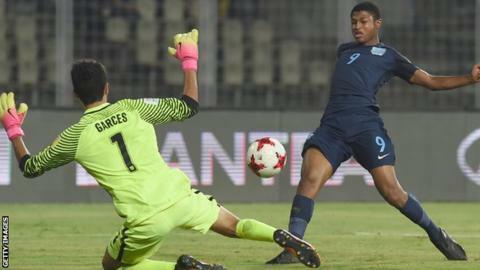 Liverpool's Rhian Brewster scored a hat-trick against the USA and Wolves' Gibbs-White grabbed the other goal. Gibbs-White, 17, said: "We might have some nerves before the game." He added: "But when we are playing, we just go away and concentrate on our game." In recent years, England's youth teams have fared much better on the global stage than the senior side, who were knocked out of the 2014 World Cup at the group stage without winning a game, while suffering a shock defeat against Iceland at Euro 2016. But Steve Cooper's Under-17 side are looking to emulate their colleagues who won the Under-20 World Cup by beating Venezuela 1-0 in the final in June. Gibbs-White added: "I wouldn't say it's a generational thing. Us young boys, we play with freedom and we have no nerves. I think we showed that against the USA. "We showed good character when we needed it. My goal came from a counter attack and it was good play and a good finish when we needed it. "The Japan game surprised us really but we recovered well for this game. We had our game plan, and I thought we stuck to that and performed like we did."